See more objects with the tag interior, domestic, home, castles, bridges, balustrades, pastoral, hunters. See more objects with the color wheat darkgrey darkgrey lightslategrey darkolivegreen or see all the colors for this object. This is a Sidewall. 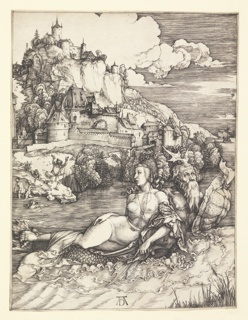 It is dated 1845–50 and we acquired it in 1931. Its medium is block-printed on machine-made paper. It is a part of the Wallcoverings department. 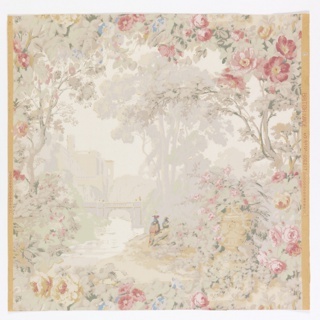 This figural landscape paper contains four different views and is printed in about 13 colors. This is a cleverly rendered pattern with a complicated format that was inspired by arabesque designs of the late nineteenth century. The earlier arabesque designs contained landscape scenes or activities placed upon thin plateaus, each delicately balanced and supported by ribbons or floral garlands. These plateaus were left open which kept the design very light and delicate. Figural landscape papers of the mid-nineteenth century contain similar views but enclosed them in rustic foliate frameworks, making the design denser. Beneath each view the ground foliage trails off, then is rendered in a silhouette format, more or less blending with the sky in the scene below, and each landscape view is delicately intertwined with surrounding views. Bridges and architectural features run diagonally to keep the viewer’s eyes traveling around the design. The densely patterned and brightly colored architecture and foliage are offset by the softly shaded voids of the sky in each view. The staggered landscape views enclosed within a vining foliate framework design format is typical for this period, as are the scenes of peasants chateaus. It seems one is always looking up at the chateaus, which increases there sense of grandeur, while looking directly at figures. Perhaps this makes it easier to identify with the portrayed figures. This object was featured in our Object of the Day series in a post titled The Delicate Balance of Nature. 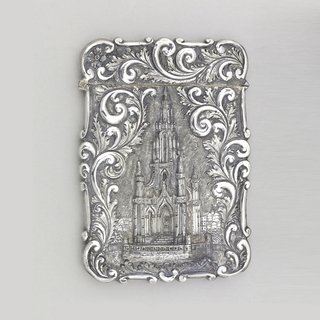 repoussé and chased moulded sheet silver. Gift of Mary Kate Conrad. 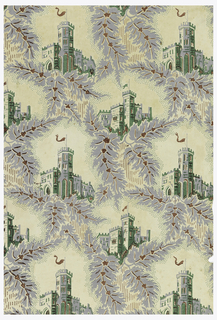 This object was previously on display as a part of the exhibitions	Hewitt Sisters Collect, Rooms with a View: Landscape & Wallpaper and The Cooper-Hewitt Collections: A Design Resource.